When last we left the Future Foundation, the Reed Richards helmed think-tank featuring the brightest young minds on Earth, they were rebuilding the imploded multiverse with the combined powers of Franklin Richards and the Molecule Man. And that’s exactly where they are when we finally catch up to them in Fantastic Four #2 by Dan Slott and Sara Pichelli. We join this multiverse-spanning cosmic odyssey in media res, as the Future Foundation explores one of the many universes that they have been creating. An unseen adventure has just concluded, and we’re immediately off to the next new universe. This journey is beautifully illustrated by Pichelli, who co-inks her own work with Elisabetta D’Amico, and is beautifully and vibrantly colored by Marte Gracia. Whatever questions I may have had about how Pichelli would handle the cosmic aspects of the FF are answered emphatically here. The artwork is gorgeous. We fall further and further down the rabbit hole of this constantly expanding multiverse, until we learn that Franklin Richards can create no further. Enter: Entropy! “The Griever of All Things,” she prefers to be called. She’s come to undo what she perceives as the false universes created by the Foundation. These “slapdash realities” begin to crumble, and the Foundation flees across the multiverse, the Griever hot on their trail. They stop to make their stand, and the Griever expresses disappointment in how easily she has defeated the Fantastic Four. Reed taunts the Griever, informing her that this isn’t actually the Fantastic Four, and that she wouldn’t have stood a chance if the rest of the family had been there. She provides him with a “transmaterializer,” which has the power to summon things from across the multiverse. True to his word, Reed summons the rest of the Fantastic Four. All of them. Everyone who has ever been a member of the Fantastic Four. The end of this story lines up with the end of the main story of issue #1, as the giant 4 seen in space there is actually from this “transmaterializer.” This gives us our long awaited reunion of the original Fantastic Four on the final page of this book. We will, however, have to wait yet another month to see any real interaction among Reed, Sue, Ben, and Johnny. 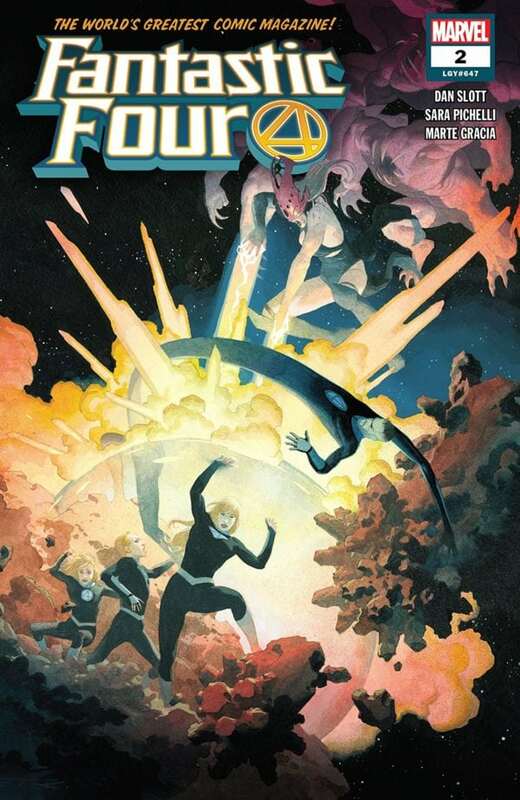 Fantastic Four #2 by Dan Slott and Sara Pichelli is a phenomenal read, and significantly picks up the pace from what we saw in issue #1. Between these two issues, it seems that Slott has nailed the tone of the Fantastic Four in a way we haven’t seen in awhile. Two issues aren’t enough to tell how what Slott promises to be a lengthy run will go, but it’s a promising start, and enough to get me in a comic shop at least one Wednesday every month.